We know the commitment and dedication it takes to building a business. Whether you’re interested in expanding your business by joining a larger, national provider, or as part of your future planning we can accommodate your interests. For over 20 years, we have built Lifemark by acquiring businesses like yours, so we understand the importance of working collaboratively starting with the first phone call through the integration of your business with Lifemark. We are experienced, straightforward, transparent and flexible, and we work hard to ensure that the unique needs of you and your staff are recognized. Our reach and our depth of services becomes an extension of your network and allows you to diversify your business while maintaining your entrepreneurial spirit. From an operational standpoint, we can minimize your administrative burdens, as we can handle functions such as payroll, finance, marketing support, digital, business development, and IT support. Our dedicated human resources staff is also available to provide guidance and recruitment assistance. Additionally, we provide access to an advanced operating system that handles online booking, claim processing, funder management, statistics and cost analysis. As part of a national company, you may have the opportunity of becoming a preferred provider with insurers. From a professional growth perspective, you will have access to a large network of like-minded colleagues who are leaders in a variety of clinical specialties and programs providing you and your staff exposure to these clinicians for mentoring and learning opportunities. 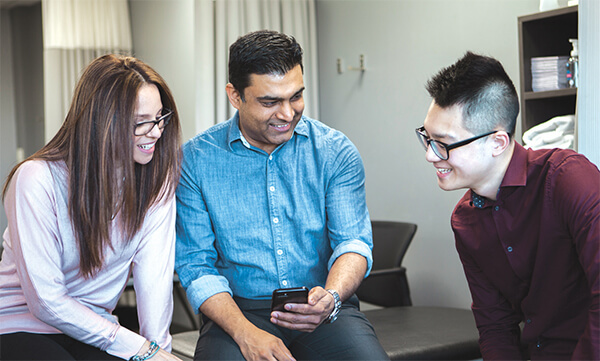 As one of Canada’s leading healthcare providers, our success comes from our greatest asset – our people. As we are like-minded professionals, we know your staff are just as important to you. Our years of experience in growing through acquisitions give us the insight, the understanding, and the skills to make the transition into our organization smooth and positive for both you and your employees. We do this by working closely and collaboratively with you to ensure the best possible experience for everyone. Our management team believes that strong internal growth is the best driver for an organization. It’s why the majority of our leaders began as clinicians, with many being former owners themselves. As your team becomes part of Lifemark, we want them to benefit from what we have to offer. We provide internal training and education programs, along with structured mentorships for clinical staff, and will work with you to either maintain current employee agreements or enhance employee benefits. We know your passion is your clients and providing them with the best possible care. We share that commitment and believe everyone deserves and should expect the highest quality of care. We offer a number of specialty programs, such as cancer rehab, pelvic health, concussion care, and vestibular rehab to provide patients with custom-tailored treatment plans to best suit their needs. Our dedication to excellence means that we collect and use the insights from outcome data, including patient satisfaction surveys and a feedback web form in order to continually learn and improve our services. R.W. Sydenham & Associates Physical Therapy Services was acquired by Lifemark Health on December 31, 1999. We were the first physiotherapy clinic network to join Lifemark outside of Ontario. Our transition was seamless and we have been pleased to facilitate the acquisition of many clinics and clinic networks across Canada since 1999. A particular joy for the Sydenham’s is that many of our clinical and administrative staff are still happily employed with Lifemark 19 years later and hopefully for many more. When Likemark purchases a clinic or a clinic network, it is not only an acquisition of the business; Lifemark is also strongly committed to you and the people you bring to the deal. 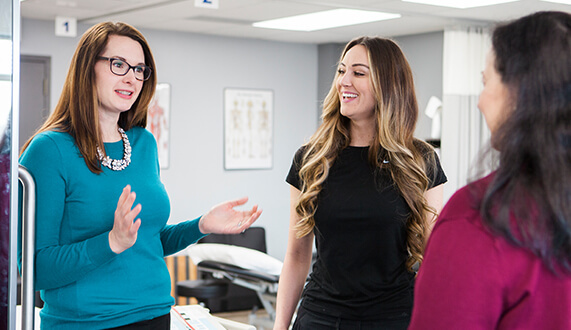 You and your team will have the opportunity to move into advanced positions in leadership, clinical specialization, mentorship and teaching in Lifemark’s extensive professional development program. Let me give you an example of movement to an advanced position in leadership. When my term as Area Manager for R.W. Sydenham & Associates Physical Therapy Services was complete, I was asked to assume a national leadership role for clinical services, which translated into developing a quality framework for the company. To say I was delighted is an understatement. From that day in 2004 until the present time, I was given the flexibility to develop an enterprise quality framework for accreditation, accessibility, effectiveness, learning, patient satisfaction, privacy, risk management and safety. I work with every division in our company and I work with an incredible national team who inspire me every day and remind me why Lifemark should be your choice. In 2000 I made the decision to sell a number of my clinics to Lifemark, a decision I am still as happy with today as I was back then. I sold because doing it all alone was hard. I have always been a team player, and I had a great team in Atlantic Canada, but I was looking for someone to share financial decisions with, to help me improve IT operations, and to share best practices with, including measuring outcomes, as that has always been a passion of mine. The culture at Lifemark is one that values people, both patients and staff. That was really important to me. I needed to ensure my staff would be happy, continue to grow and develop their potential, and that patients would be well looked after. A high standard of service, nice locations, and a friendly atmosphere that cared was all part of what I had created and wanted to continue. Leadership is a passion, seeing and developing potential in staff is a must for me. Lifemark continues to develop leadership programs and clinical competency programs as well as new and innovative ways to deliver quality service to patients. My Atlantic Canada clinics have been allowed to grow and thrive under Lifemark and I am still at the helm, working autonomously, with the support of a great national leadership team. Eighteen years later my career path is still with Lifemark, and I couldn’t be happier. I joined Lifemark Health Group as an affiliate three years ago. During these three years, while working closely together, I realized that Lifemark and my organization share the same values, vision and work ethics. Our relationship is based on mutual respect. Early 2018, my partners and I sold our business to Lifemark. We are given a great deal of autonomy, and this way of managing really permits me to use my entrepreneurial skills to develop new ideas, new programs and new services. The acquisition has permitted me to use my leadership to create a company that can grow and innovate together as a team. Lifemark has made sure that my company is supported for future growth, and has made us as part of its National network.